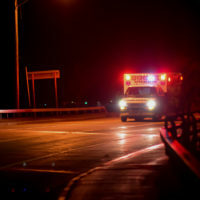 A recent case before the New York Appellate Division highlights a law that many New York drivers might not know about that affects how they should react when passing emergency personnel pulled over along the side of the road. You may not realize that the law requires you to give stopped emergency personnel, such as police officers and ambulances, a wide berth when driving past them. Under the Ambrose-Searles Move Over Act, Vehicle and Traffic Law § 1144-(a), New York drivers are obligated to “exercise due care” when passing an emergency vehicle that is pulled over on the side of the road with its lights flashing, in order to protect the lives of the emergency personnel who may be walking along the side of the road. The law, which entered into effect on January 1, 2011, requires that drivers who are in the right-most lane next to the shoulder change to a neighboring left lane, provided that in doing so the driver complies with § 1128(a), the law on making safe lane changes. In other words, a driver should always change lanes toward the left when passing pulled-over emergency personnel unless doing so could cause another driver to veer, cause a crash, or slam on their brakes. The recent case, titled People v. Krahforst, was based on a traffic citation for a violation of § 1144-(a). The driver, Jacqueline Krahforst, had passed two police patrol cars stopped along the road with their emergency lights activated. Krahforst described being behind a large truck when approaching the police officers. She testified that she had checked her rear-view mirrors in order to find out whether it would be safe to change lanes, but said that she “didn’t feel that it was safe” based on the fact that she saw an oncoming car, so remained in the right-most lane while pulling as far left in the lane as she could. One of the officers stopped along the road, however, watched the van driven by Krahforst, and testified that she had “plenty of room…to move over at all times.” The officer pulled her over and issued a citation for violating § 1144-(a) by failing to change lanes. Krahforst contested the issuance of the citation, claiming that she could not see the officers far enough in advance to change lanes due to being behind the truck, and that she did not think it was appropriate to change lanes. The court summarized her defense as arguing that § 1144-(a) does not require a driver to change lanes where the driver “sincerely believes a lane change is unsafe.” However, the court disagreed with this argument, ruling instead that drivers are required to change lanes to avoid emergency personnel if a reasonably prudent driver would have found it safe to do so. Whether the driver “feels” that a lane change is safe is irrelevant if a responsible and attentive driver would have made the lane change. For legal help with traffic accidents, truck crashes, or bicycle accident in New York, contact the knowledgeable and effective Manhattan personal injury attorney Leandros A. Vrionedes for a consultation at 212-889-9362, or 718-777-5895.